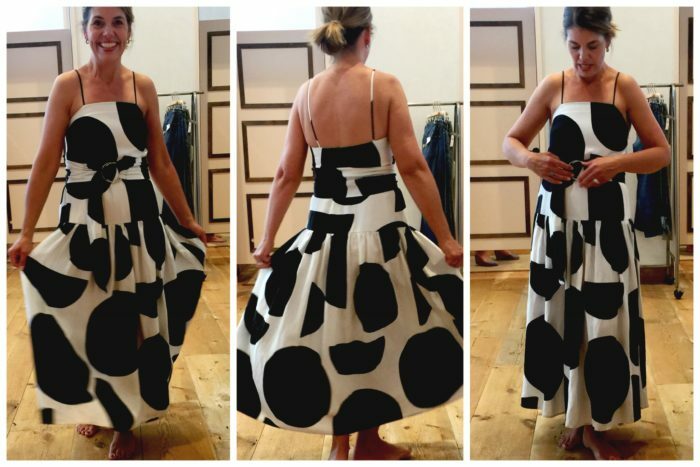 If you love dress reviews, which I know many of you do, this is a post for you! 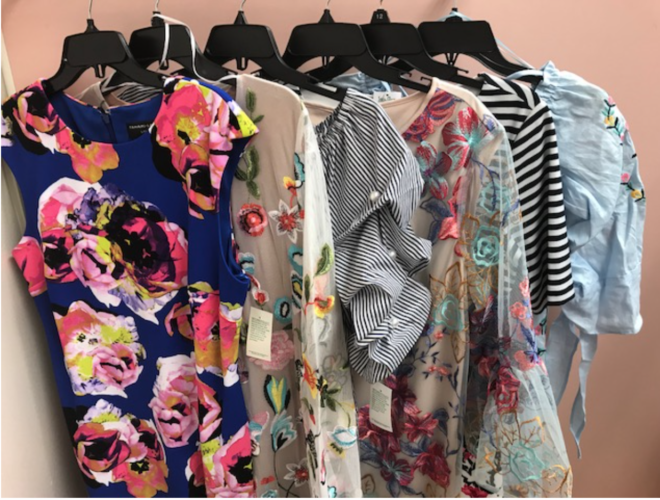 In collaboration with one of my favorite my blogger sisters Julie Augustyn, one of the 3 friends who make up of Fashion Trends and Friends (FTF), we hit the mall in Illinois and California to bring you a look at what is happening out there in the world of dresses this spring season. As we approach summer, graduations, showers, weddings, vacations, etc. a dress or two may come in handy. 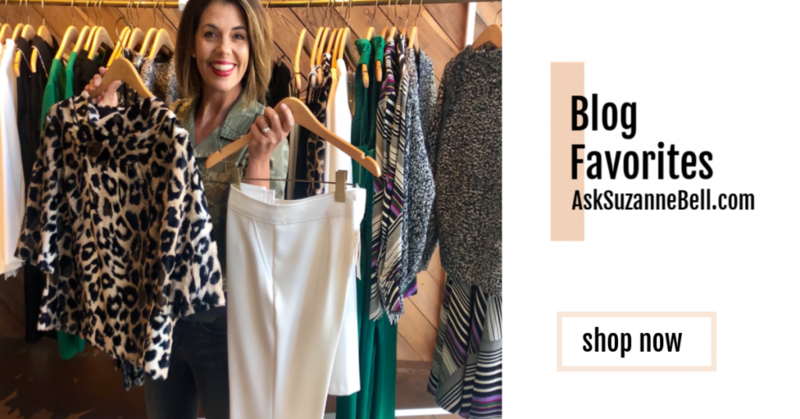 Julie and I have rounded up 18 dresses from Stein Mart, Dress Barn, JCrew, Anthropologie, Tory Burch and Ann Taylor for you to take a look at. Once you check out all this dress goodness, I invite you to drop us a line down below and let us know your favorites! What trends speak to you this season? When you are finished joining us in the dressing room, why not pop over to TFT and check them out. 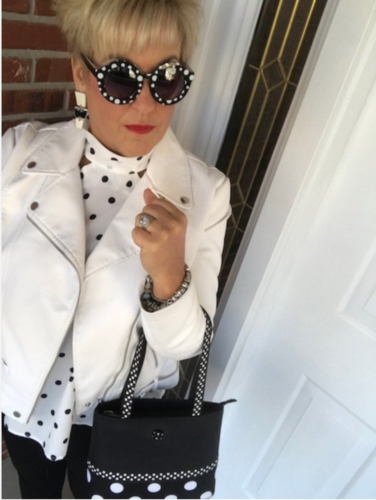 Like coffee with friends, I love following Julie, Cindy and Lori over at www.FashionTrendsandFriends.com and I think you will as well! If you’re an avid FTF follower, you know I’m a huge fan of Stein Mart for multiple reasons! First, they have unique, trendy pieces. I can always find bold, interesting jewelry and accessories. Their prices can’t be beat! Stein Mart’s current dress selection is vast! I was able to grab a hand full of dresses and off to the fitting room I went! Do you notice a trend? Apparently, I was drawn to floral and stripes! Both of which are trending…two of the floral dresses were embroidered. A continuing trend! Excuse my laziness in not wanting to take off my pants and my polka dot shoes! Although the whole look actually works together! I’m admittedly terrible at pattern mixing but think this is a mix I could actually pull off…stripes, floral and polka dots for the win! This dress was very comfortable! It wasn’t for me due to my long body torso and large chest. I would have liked it better if it sat slightly lower on my waist and not so high. This is a typical issue for me with this cut of dress! 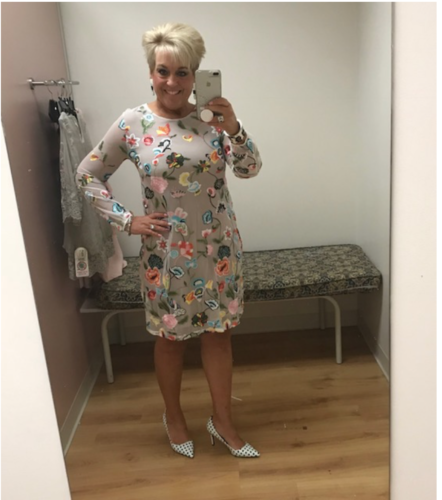 How cute is this dress?! I love everything about this dress!! It was so comfortable. The only drawback in my mind was that it was really short especially if needing to bend over or sit down. I wished it was a smidge longer! 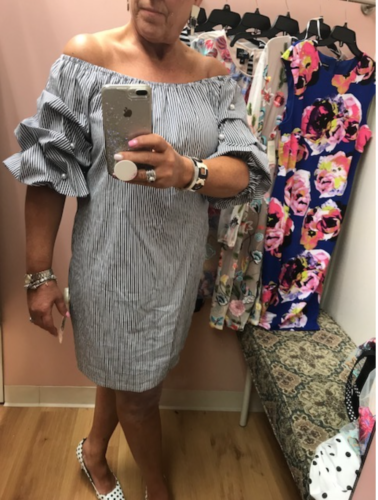 Statement sleeves, pearls, stripes, bare shoulders, comfort and cute…this is an all around win in my book! The length was good! It hit just above my knee! I also think this dress could be dressed up or down and worn to many various occasions! Where would you wear this dress? This embroidered floral, long sleeve dress is far more gorgeous in person than it photographs! The length was great! The fact that it has long sleeves is great for Illinois as our spring is almost nonexistent; and I’m almost always cold. It’s also great if you’re trying to camouflage any arm flaws. Unfortunately, the chest was much tighter than I like, which caused me to be uncomfortable. Sizing up wasn’t an option as then it was too big all over. This Tahari dress was a huge hit in my book! I feel as though it’s figure flattering. The material was soft and comfortable. 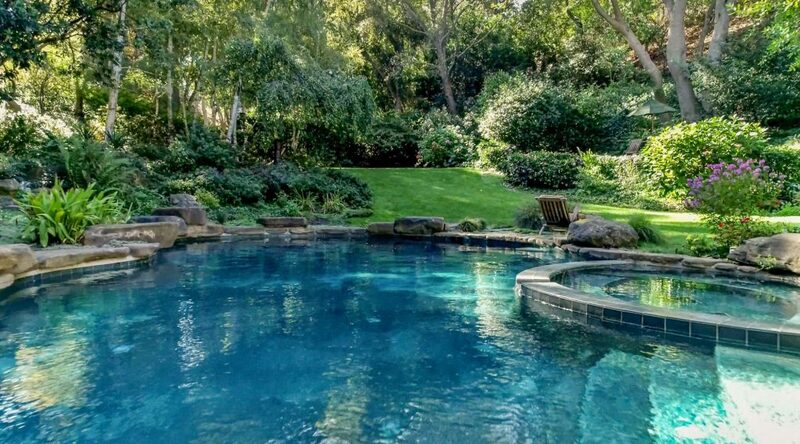 I loved the large, bright floral on the rich blue color! It gapped slightly in the arm pit area, which might require some alterations. The best part about all of these dresses is that every single one was UNDER $50! At those prices, you can purchase multiple dresses, afford alterations, purchases shoes and amazing accessories and not break the bank!!! So which one is your favorite? Which do you think I purchased? 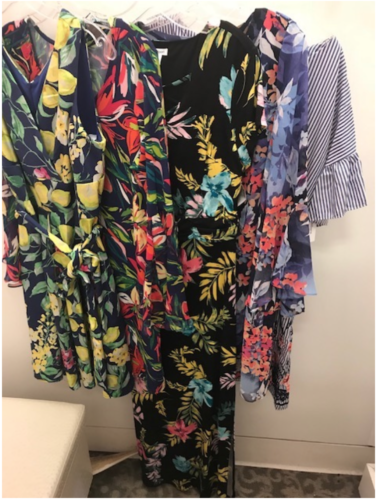 I was on my way out the door when I discovered these dresses necessitating me to go back into the fitting room! Do you ever do that? This is why I don’t like to shop with my husband as he hates when I do that…I can’t help myself! Shopping alone or with girlfriends is always so much more fun! The brightly colored, embroidered floral sleeves caught my eye as well as the fringe detailing on the hem of the sleeves and the dress! The navy dress was made of t-shirt material so soft and the sleeves were so cute! These two dresses had a more casual vibe perfect for a day out or a date night! I finally made it out of the store and on to my next stop! I recently purchased my first little black dress at Dress Barn for a fundraiser/fashion show. As previously mentioned, Dress Barn typically has a vast selection of dresses and the prices are also very reasonable. They carry petite through plus sizes. 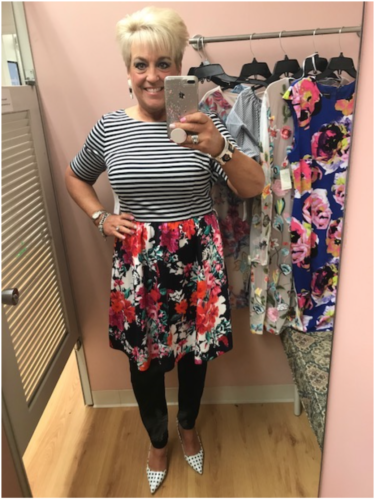 More floral and stripes! I couldn’t help myself! It’s what is in the stores and I like BOLD! Loved that this striped dress had fun sleeves and embroidery! 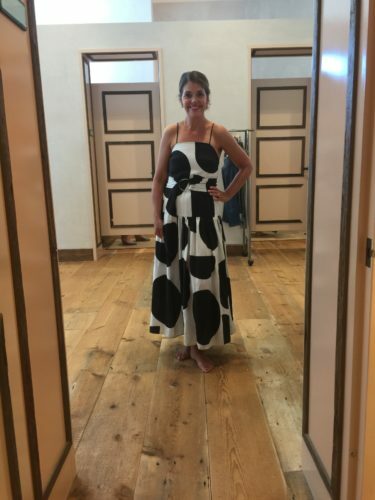 This was the most expensive dress that I tried on at Dress Barn. It costs $54.00 but they always have sales and coupons so I’m sure you could score it for less. I didn’t like where the waistline hit my body. It’s similar to the dress at Stein Mart regarding my long torso and hitting me to high. This blue floral dress had many pluses…comfort, length, bell sleeves and interesting detail at the neck! 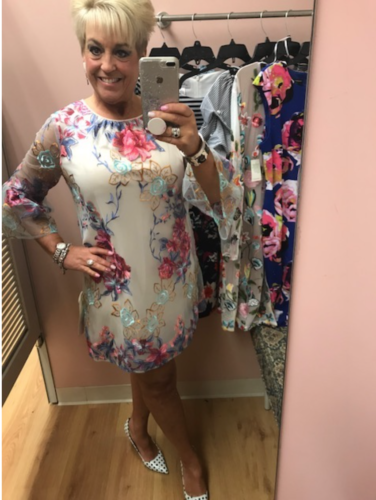 It’s figure flattering and non-clinging! 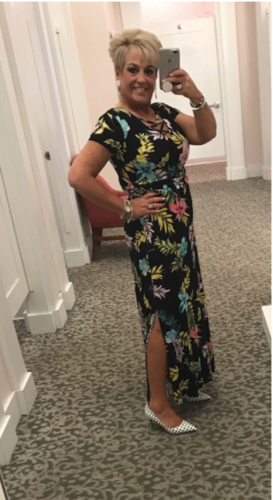 This maxi dress was a big win in my book! Love the slit on one side, the criss cross detail, the banding around the waist and the comfort! I must admit I was truly enjoying these try on sessions mainly because of my weight loss (Weight Watching Wednesdays)! It felt good to like almost every dress and feel confident in each! This could also be dangerous as I could have walked away with everything I tried on – HA! 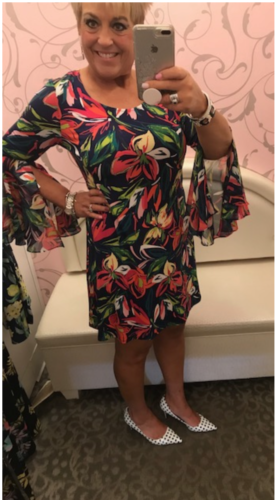 This chiffon split sleeve floral dress was very comfortable and figure flattering. The length was just right. You could style this as a tunic over leggings or even jeans! When making a purchase, always try to think of at least three ways you could style it to get more wear! 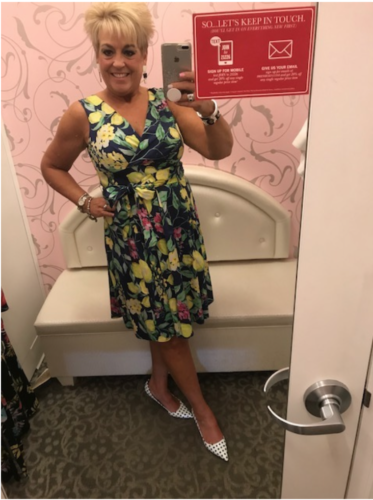 This lemon print fit and flare dress was darling! Lemon print seems to be on trend for this summer. 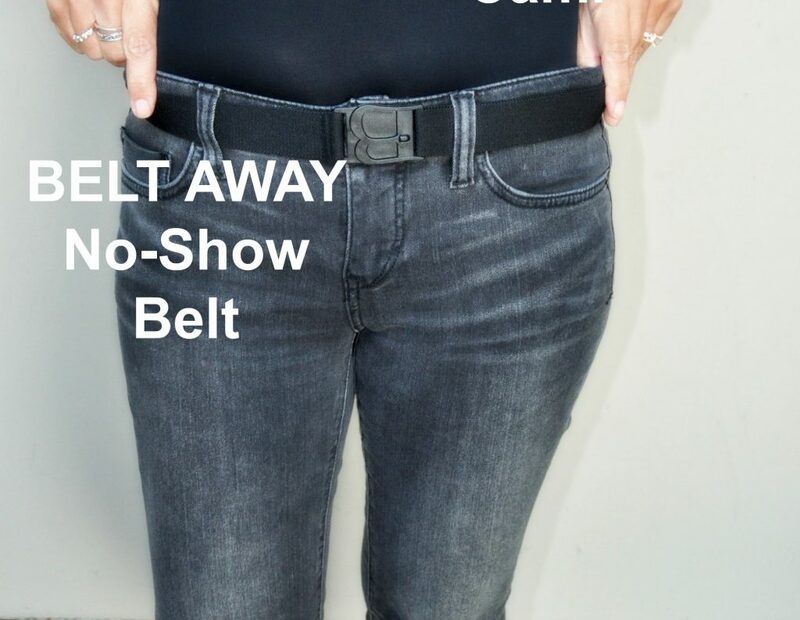 I would have liked the wrap tie to sit lower on my waist and would have loved some pockets. For my part of today’s dressing room reviews, I visited 3 of my go-to mall stores. My favorite stop this visit was Tory Burch, but on my way out of the mall I took a peek into Ann Taylor and I have to say, if you are in the market for a dress; perhaps START here. I would add Nordstrom to the list for a dress mission as well. 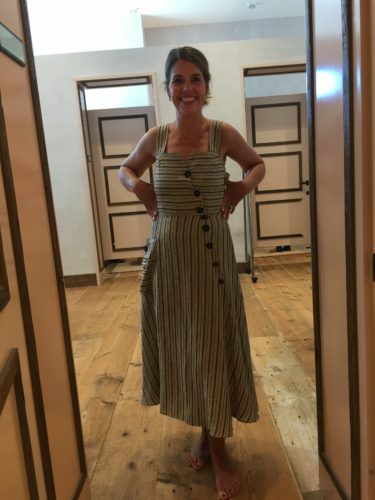 I found Anthropologie to have unique, but not all wearable easy pieces. That said, the sale rack was chock full of contemporary designer dresses so I think they may be undergoing a vendor shift at Anthro – worth checking out! 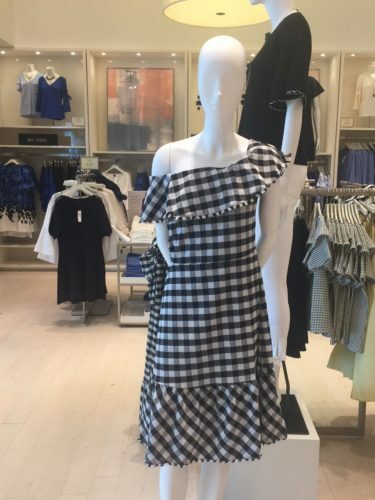 J Crew had a few cute dresses, but I think they are having some fit issues with the departure of our friend Jenna Lyons. I asked around and I am not the only J Crew shopper who feels this way at the moment. 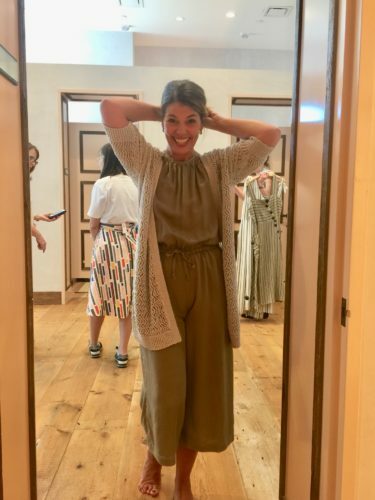 I recommend trying on any J Crew pieces in store if possible. 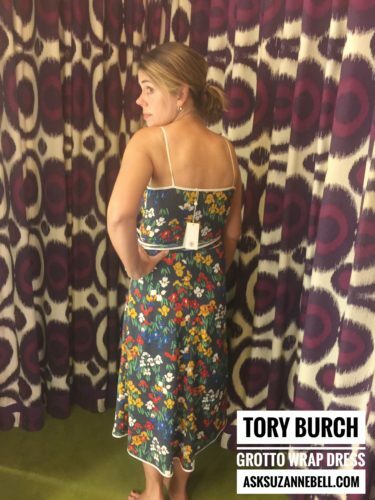 Tory Burch had some gorgeous new arrivals in not only dresses but also shoes! What do you say we take a look? 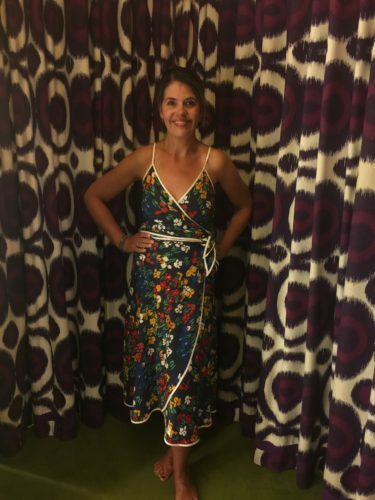 If you can get your size right in this easy to wear summer dress, lucky you! Designed in my opinion for an hourglass shape (which I am not), this dress runs about 2-3 sizes too small. I had to go up to a size 12 from my regular size 4/6 just to get the waist to fit and the top was then too big. MAYBE the 10 would have fit. Goes to show, know your body type and don’t take size tags at face value. Bummer for me because I think this is the perfect summer look. Layer a tee under it or a cardigan or denim jacket as a topper and off to the farmers market you go! Available in regular and petite | $168.00 | runs at least 2 sizes small. 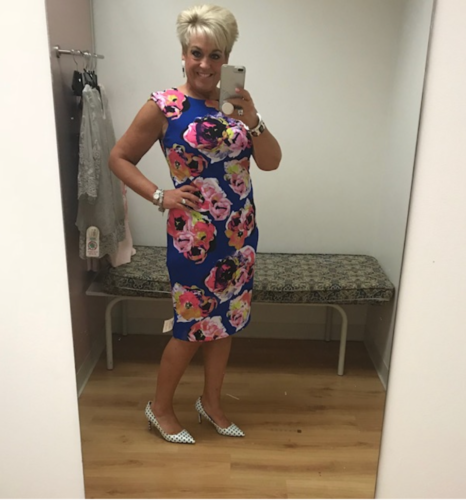 I loved so much about this bold printed midi dress! Dressed her up or down. 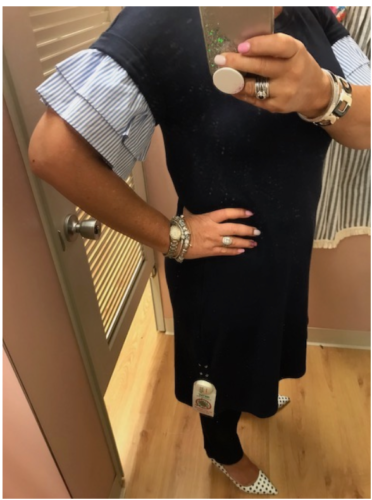 This ran a bit large in my opinion; some reviews say perhaps to size down, I am wearing an XS vs. my regular size small. A statement dress that can be worn with or without the belt for different looks. XS-XL | $450 | That’s me doing the sale dance on this one! This free-flowing wrap dress is an ode to legendary designer David Hicks’s interiors and gardens. For my body type, a banana, a V-neck, wrap style is my BFF. Worn alone or with a denim jacket or cardigan, I would love to add this floral beauty to my closet some day! The Resume dress is one I have always been curious about. A J Crew best seller, one was available in black for me to try on in the store. Fit is TTS on this ready-for work flattering sheath. What I love about this sheath is the cap sleeve – I find it to be super flattering and covers all bra strap issues. Yes, this is not a dress, but some of us prefer separates, right? I wanted to share this peplum top because I think it is so flattering and a great piece to wear with springtime skirts. It has really mixed reviews stating it is difficult to tie, I didn’t have a problem tying it, and it is reversible! Now on sale in black, white and stripe! The skirt is supposed to be worn to the side, whoops! 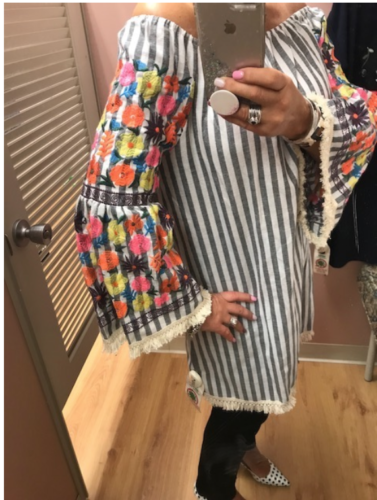 The styling is cute, but I thought the fabric was cheep for the price. I would not buy the skirt at regular price. Also available in denim. Reviews state it runs big, but I am wearing my regular JCrew size 4 and would not be able to size down. If you are an hourglass or pear shape though, you may need to size down. As I mentioned above, I caught a glimpse of Ann Taylor on my way OUT of the mall. 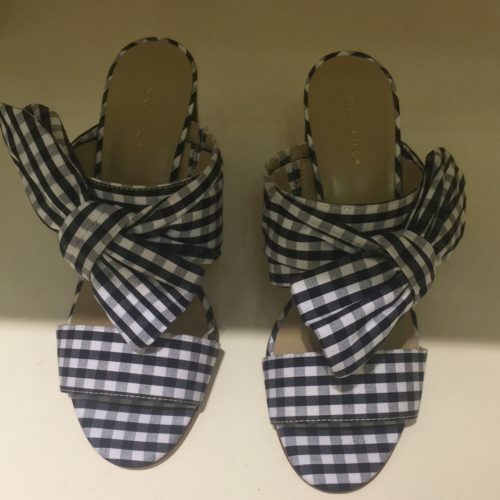 I only had time to snap this quick photo in the event gingham strikes your fancy this season. These darling bow mules are also available in black…swoon! Phew! 18 new dresses, now tell us what you think! I’m noticing a stripe/ blue floral theme happening here with sleeve details continuing. I did notice a strong gingham as well as chambray trend continuing in dresses as well. 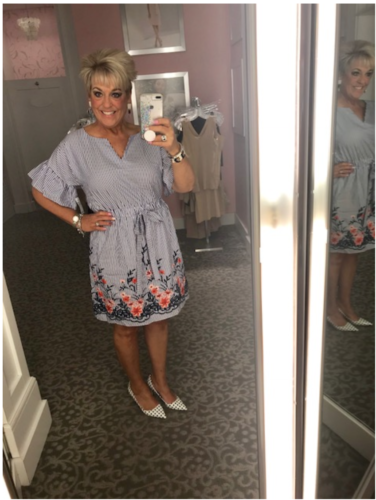 I love this post with Julie and you shopping! You both have great fashion styles and enjoy stylish clothes! Thank you for sharing Julie with us today! Hi Robin! Thank you for stopping by! Julie and I had so much fun collaborating on this post! THe ability to show both our body types, style, and shops we love in one post was really special. We plan to do another such post again in the future for our readers! Great post of shopping theses lovely dresses! I saw a couple that have my name on them. I loved following you both with dresses this way!! Hi Jodie! We have gotten great feedback from readers on this type of post and julie and I really had fun putting it together. I think you will see more of these from us in the future! We have the Fierce 50 to thank for bringing us together! This is such a fun collaboration! 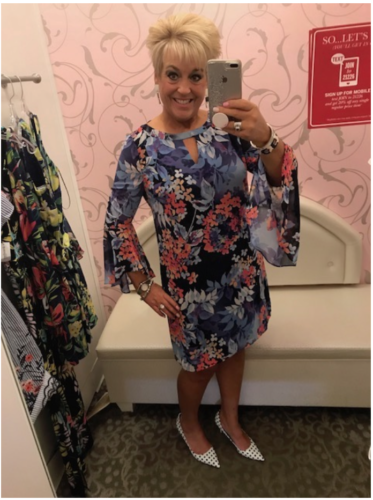 I love fitting room posts! And the dresses you were showing are amazing! Hi Cheryl! Thank you for stopping by! Julie and I loved collaborating on this together as we were able to show so many different looks and places to shop! Hi Patti! That is exactly our thoughts! I had such a fun time collaborating with Julie and loved being able to show so many different looks and styles.